It might be a tradition for some families to have a Christmas Tree during holiday. But if you live in a small place or simply fed up with real christmas trees, you can DIY your own Christmas tree without dealing with any pine needles. Since you are making your own tree, the size, color, style and texture will be completely on your own. And it will be a great project to share with kids. 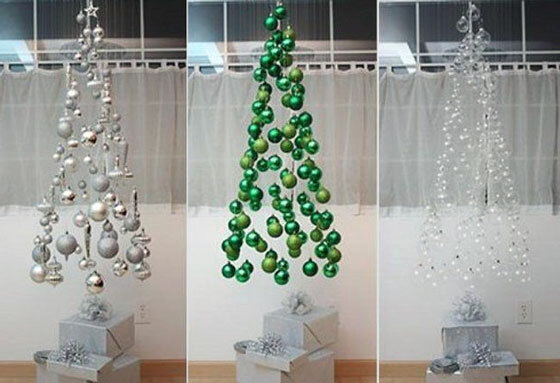 Here are 12 Creative DIY Christmas Tree Ideas for your reference. 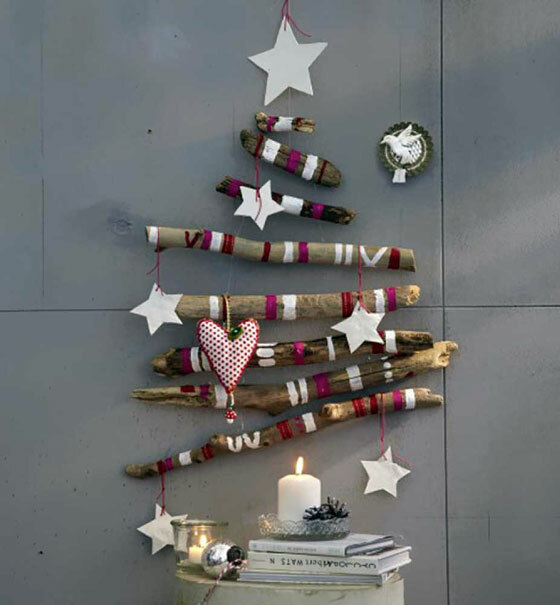 And if you look for more, do check our last year’s list “16 Creative Unconventional Christmas Tree Ideas“. How about celebrating Christmas by eating the Christmas Tree? 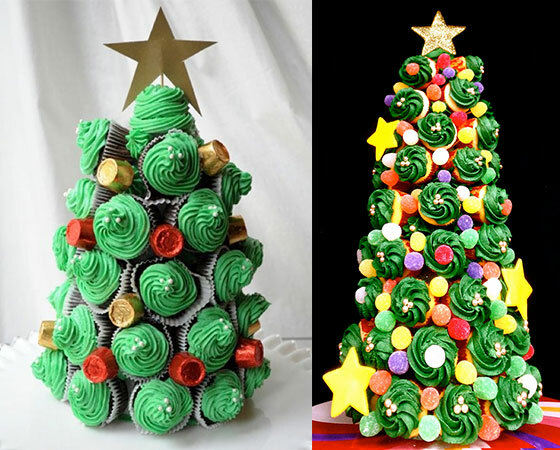 Cupcake Christmas Tree can easily fulfill this request. They are stunning to look and delicious to eat. Will serve as an alluring centerpiece until greedy hands have their way with it. 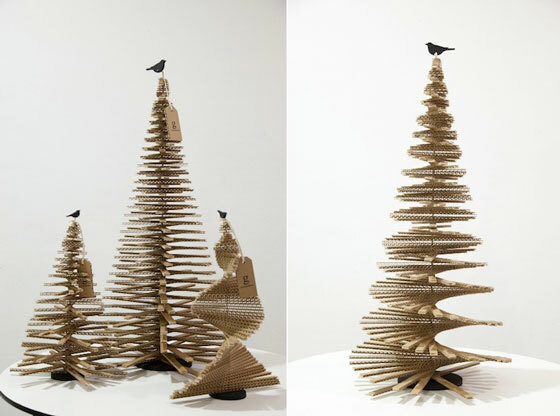 This really eco-friendly Christmas tree called “bespoke”, is designed by Giles Miller. Come in two different sizes: the smaller one is 16.5 inches tall and costs £25 while the larger tree, which is 31.5 inches tall, costs £15 more. Compared with its real or fake alternatives, the cardboard is way less messy to deal with. In order to erect the tree, one need only attach the wooden base and a lovely wooden bird. 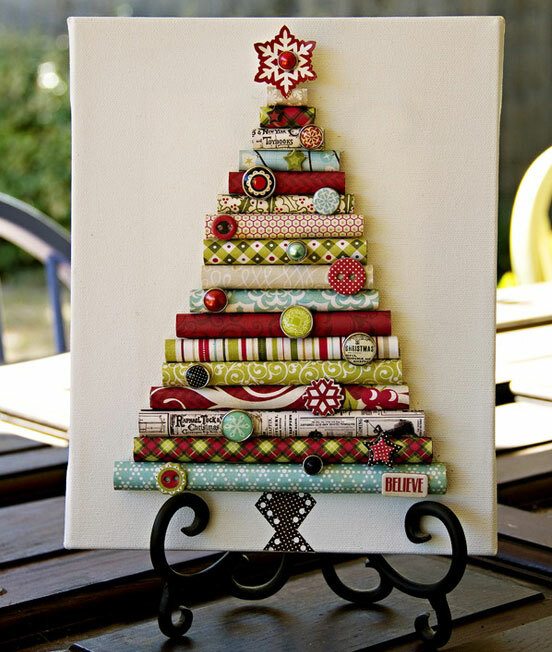 If you have some left over wrapping paper, then you can create this beautiful table Christmas tree display. It just simply fabulous. This Christmas tree mobile consisting of ornaments suspended on clear threads. And presents can be put below it. Find some unused wood branches, choose or cut them into different length. Paint with your favarite color then add some decoration. Connect those branches and hanging them on the wall…. Then you will have a wood Christmas tree. 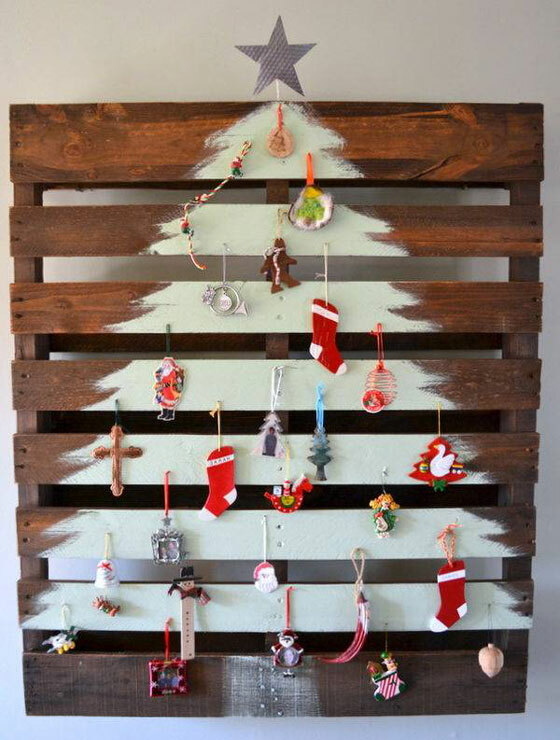 This unusual Christmas tree is a clever way to reuse an old wooden pallet during the holiday season. No any cutting job needed, you just paint the Christmas tree directly onto the pallet. When it’s dry, a few nails can be tapped into place to provide the perfect place to hang a few ornaments. It is super small compared to a real Christmas tree, but you can make them yourself. 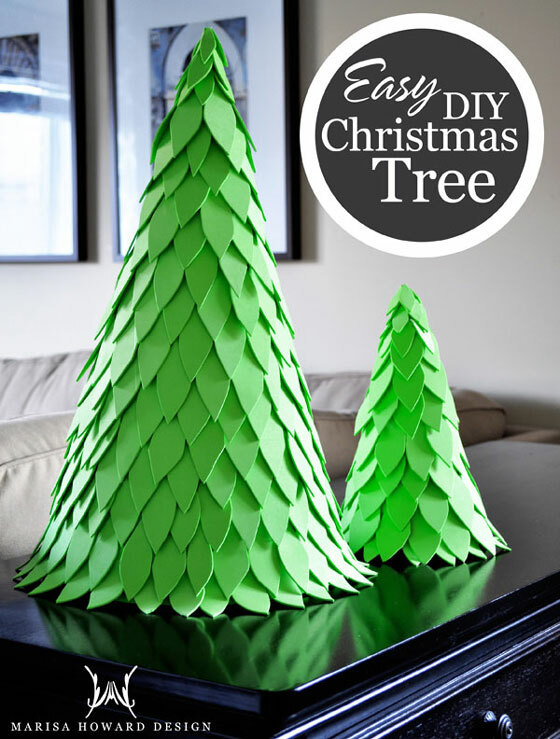 And if you make a few of these, you can create your own Christmas tree forest. 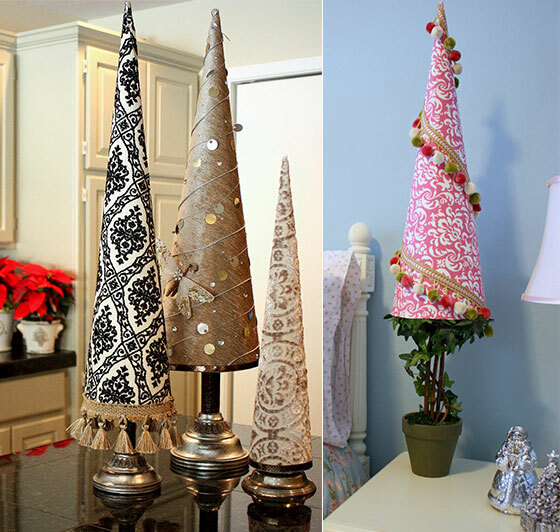 These fun trees were cardboard that had been rolled into a cone and adorned with fabric and trim! It is pretty easy to make and you can decorate them with shinny string, buttons or anything can go with fabric. Just rest them on tall candle sticks/holders to raise them up and display them. 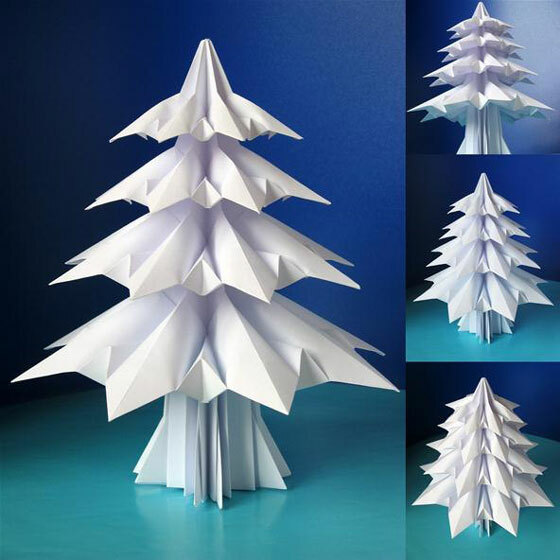 You can make this bright foam Christmas trees with a piece of Bristol board and bright green foam sheets. First rool bristol board into a cone shape then tape up the side to keep it held together. Draw some simple leaf shape on foam sheet then cut them out. Then you glue those leaves and place them side by side starting at the bottom of the cone. 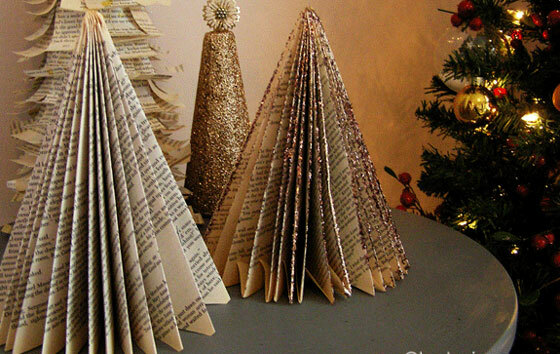 This decorative paperback Christmas tree is super cute, easy to make, and affordable. It’s even a great craft to do with your kids. All things you need is a paperback book, an exacto knife, dry adhesive, glitter and glue. 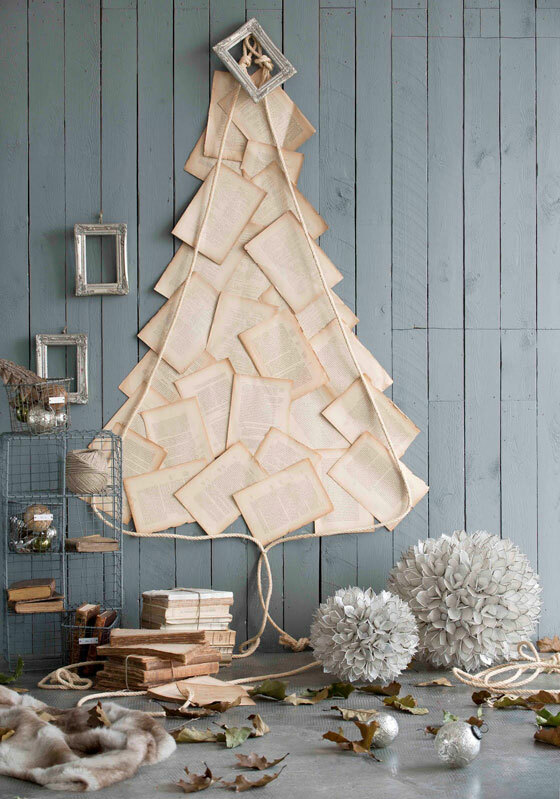 Just use some old torn paper then layer them together to create a tree shape on the wall. Frame it with some string as you want. Then you will have a really stylish Christmas tree on the wall. If you are those people who never waste food, then this is not the tree for you. 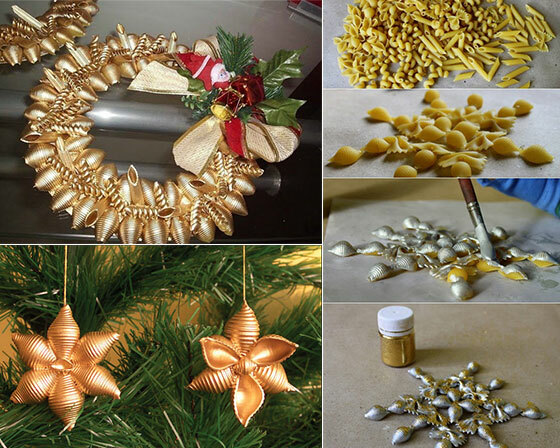 But if you are OK with using some pasta as holiday decoration and looking for some fun Christmas crafts for kids, then you should check these adorable Christmas tree. 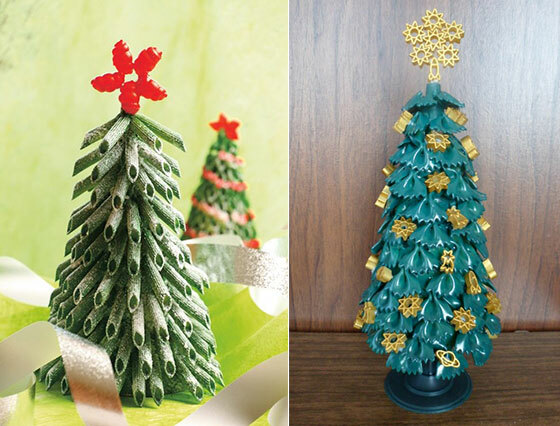 With different kinds of pasta you can create amazing snowflakes, flowers and small tabletop Christmas trees.